The Perris Family came from Oakleigh to the Mallee. 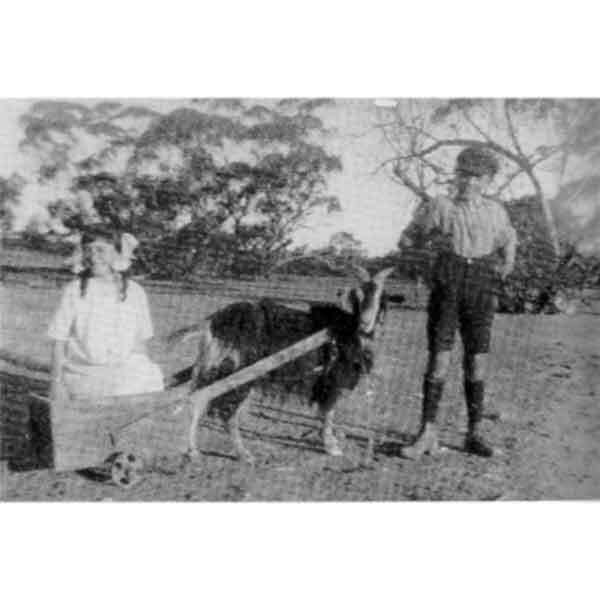 After a short time at Nullawil and Culgoa, they moved to Ultima in 1925, and settled on a farm east of Ultima, off the Swan Hill and Lake Boga Roads. In 1932 Perc Perris and his Dad opened a Butchery Business in Ultima, which this family had for 24 years. The eldest son, Frank, did not come to the Mallee, as he was employed in the E. S. & A Bank (now A.N.Z.) in Melbourne. The family was very community-minded, and were involved in all organizations for the advancement of the Town and District, and they were all fond of sport, particularly football. Four of the boys married local girls. Bill and Perc were members of the Ultima Dance Band, and also liked to entertain at Concerts. Mrs Perris held every office in the Ultima C.W.A. Branch, and was President of the Red Cross Branch for 12 years. She was also Secretary of the Send-Off and Welcome Home Committee, during the War. Sid was fond of horses, and spent his spare time training race horses for the Conway Family. In 1938 Sid and Ron Atkin spent a year on a sheep station out from Alice Springs. Bill was one of the wheat lumpers who built the huge wheat stacks in the station yard, and for a time he was in charge of the small silo. Later he helped his Dad with the Butchery Business, when Perc went to War. Perc and Sid joined the army - Sid went to the Middle East and was a Rat of Tobruk. Perc went to Singapore, where he was in a POW Camp in 1943. Sid returned home, and had a Soldier Settlement Farm at Warracknabeal, and later at Heywood. Les left the farm in 1942 and went to Melbourne, where he was a Chauffeur for Members of Federal Parliament during the war. He drove Government Interstate Transports for 25 years, and was presented with 2 medals from Footscray Council for safe driving. Bob sold his farm in the late 50's and went to Elmore for about 5 years - he then moved with his family to Cunninyeuk and Moulamein. Hazel has been a member of the Ultima C.W.A. for sixty years, the District Guide Commissioner for six years and at present Secretary of the Senior Citizens Centre. Sid and Hazel are the only surviving members of the family. Hazel still lives in Ultima, and Sid in Geelong.